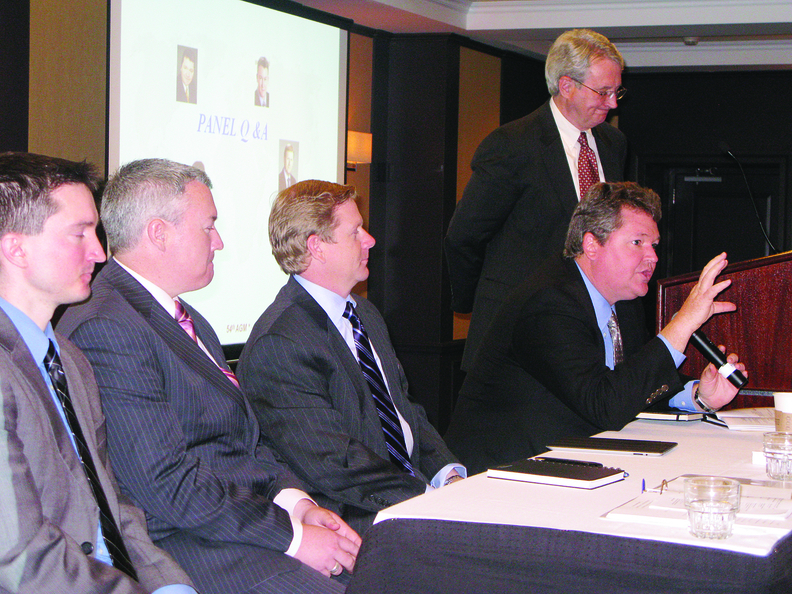 Bill Hyde of IHS Chemicals emphasizes a point during a panel discussion. At left is panel member Michael Bloesch, TPC Group, and standing is moderator Paul Brisson, Argus DeWitt. Styrene-butadiene rubber prices should be relatively stable this year and next, according to a market research expert. There's a caveat, however, in the good news for SBR customers. "We're talking about relative stability at high historical prices," said Bill Hyde, senior director of olefins and elastomers at IHS Chemicals. He indicated SBR prices in the U.S. are more than double what they were before the beginning of the recession in 2000. The trend is even higher in Western Europe and Asia. At the same time, the SR business is undergoing significant changes, Hyde said during an April 16 speech at the International Institute of Synthetic Rubber Producers Annual General Meeting in San Francisco. The executive said IHS's research shows commodity rubber use continues to grow in China—from 30 percent of total global demand in 2012 to 35 percent in 2017—while consumption will fall by a percentage point or two in the other regions of the world. The big dynamic, Hyde said, is in production. There is a great amount of solution and emulsion SBR, as well as polybutadiene, capacity being installed in China, Hyde said. While production capacity increases flatten out in forecasts for the 2015-17 period in that nation, the IHS executive said his company doesn't believe it. "I don't think anyone believes there will be no addition of capacity then (2015-17), but it's just that no one has announced plans with that much lead time. We do believe there will be continued capacity added in China." That will have an effect on SR makers in other regions. "Rubber producers that have traditionally shipped into China are now in some cases going to find other locations to sell their material," Hyde said. "Typically, their material is not going to be welcomed in their new markets, at least not by the domestic producers, and their domestic consumers will be thrilled to have another supply source. There will even more robust competition." • A category of Northeast Asian nations other than China—South Korea, Japan and Taiwan—has more capacity than it needs domestically, and that won't change in coming years. "Northeast Asia will be a region that is going to cause local friction by looking for alternative markets for its SR production," he said. • Much investment in SR capacity is going on in Southeast Asia and India, and that region will be a bigger producer than the former Soviet Union—excluding Central Europe—by 2017. "This will cause a shift in the market," he said, affecting SSBR and polybutadiene, not so much ESBR. • Butadiene capacity additions are concentrated in China, both conventional and on-purpose. In the U.S., the success of on-purpose butadiene will be a critical market indicator, and butadiene supply in North America will be limited for awhile.